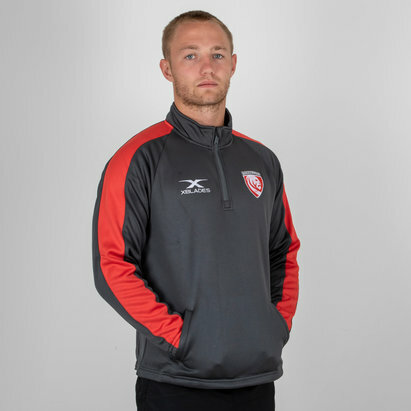 Display your loyalty to the club when in the gym, on the training field or out and about with the Gloucester 2018/19 Players Presentation Rugby Jacket Jacket from X Blades. This official presentation jacket of Gallagher Premiership team, Gloucester Rugby, comes in a grey and red design that represents the clubs traditional colours and features the brand new club badge printed upon the chest to prove to all the doubters where your loyalty lies. Made from 100% polyester material, X Blades XPF mesh moisture management technology helps keep the wearer feeling cooler, drier and more refreshed when in action by drawing sweat away from the skin and quickly drying off. This jacket will have you looking just like your heroes. * A bonded softshell material with a fleece lining and water-repellent coating helps keep you warm & dry in poor conditions. * This groundbreaking fabric makes this training top comfortable to wear. 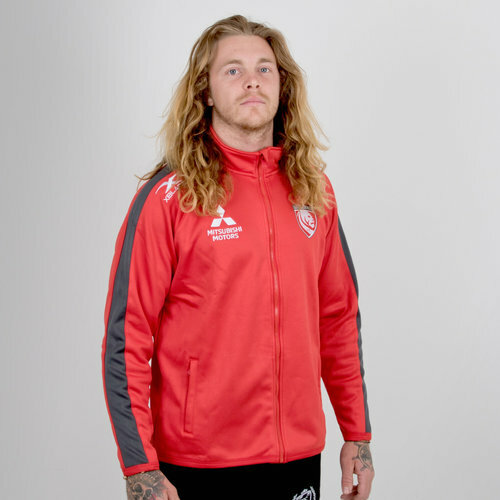 Stay warm when you work out or hit the streets without ever compromising your support for Gloucester Rugby with this Gloucester 2018/19 Players Presentation Rugby Jacket.